Wood pellet grills are prized by many for their ease of use and overall efficiency. Larger units are meant to do double duty as a high, yet indirect heat grill, that you can also use as a hot smoker. Some of the well-designed larger units like the ones in the Pit Boss line can produce competition level barbecue. 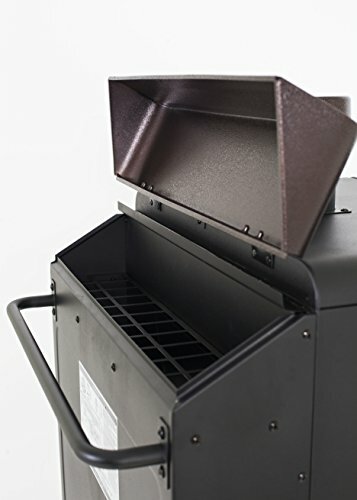 While some wood pellet grills can produce lower temperatures in the 200-degree range, they aren’t really designed for so-called “Cold Smoking.” Of course, where there’s a demand someone is sure to offer a supply. 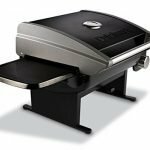 Pit Boss is a grill and smoker manufacturer that has started to develop a reputation for blending high quality with consumer-minded design throughout their line. 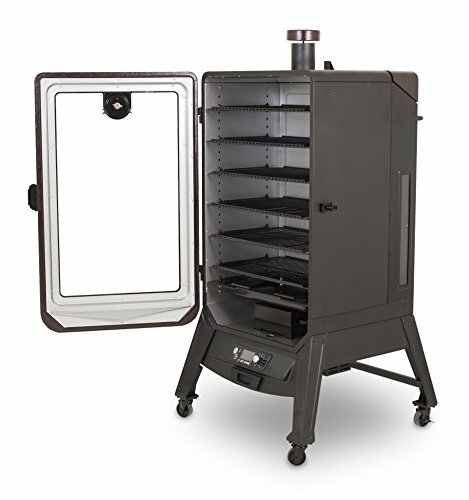 Their 77700 Wood Pellet Smoker is designed to handle a broad temperature range. When it is set up just right it is capable of producing a very consistent 150-degrees for smoking things like salmon, trout, and shell-on shrimp. This low range “Cold Smoking” is ideal for doing things like transforming your own smoked pork belly into homemade slab bacon. Yet it is also capable of traditional “Hot Smoking” with temperatures as high as 450-degrees. This allows you to also barbecue pork shoulders, briskets, turkeys, and whole chickens. 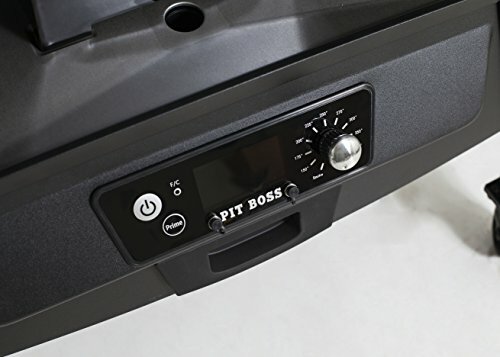 The Pit Boss 77700 Wood Pellet Smoker comes with a digital controller, as well as a probe thermometer. If you need to monitor multiple pieces of meat, you may want to invest in other remote/wireless temperature probes. It has a high capacity hopper capable of holding up to 40-pounds of wood pellets. It also has a special pellet purge system to help remove leftover wood pellets after you are done. 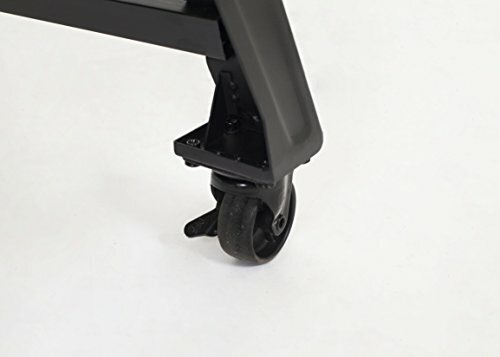 Pit Boss strives to develop a loyal customer base by infusing their product line with quality materials, thoughtful design, and attention to customer feedback. This is reflected in the Pit Boss 77700 Wood Pellet Smoker. Assembly isn’t too difficult. With some basic tools and a close read of the instructions, you should be able to put it together in a little over an hour. Having a second person to help you will certainly be nice. 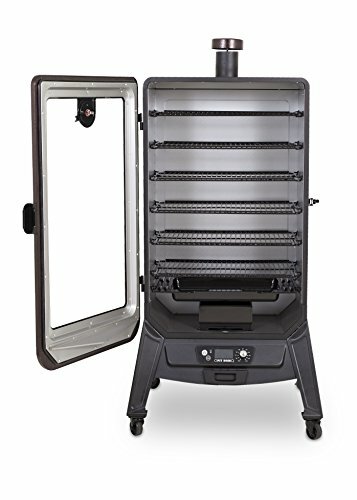 One minor miss with the Pit Boss 77700 Wood Pellet Smoker, is that it only has one meat probe, yet it comes with six smoking racks. This means if you have multiple things you are smoking, like say a country ham in the lower section of the cabinet, and bacon slabs at the top, you will need to buy a second remote read thermometer. Pit Boss does make an effort to compensate for this by porcelain coating each of the racks. This isn’t something you necessarily get with competitor units in this category who tend to cut corners on prices with stainless steel or chrome plated grates. 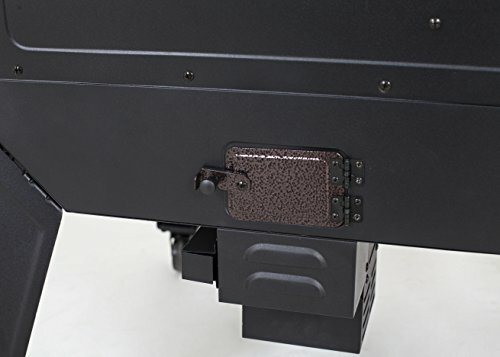 The 40-pound hopper has perhaps the highest capacity of any of its competitors. It also has a pellet purge feature which helps remove leftover wood pellets after a long smoking session. This is very important, as wood pellets can gradually react with ambient humidity in the air. Over the course of a day or two high humidity can cause the natural lignin binder in the wood pellets to break down turning them into a nearly immovable block of wood fibers! When you first set it up, you will want to run it at 350-degrees for a few hours to season it in and break down any of the protective chemical coatings that were applied to protect it during shipping. The main appeal of the Pit Boss 77700 Wood Pellet Smoker is its ability to get as low as 150-degrees, yet as high as 450. This means you can “Cold Smoke” fish fillets, shell-on seafood, and things like ring or linked sausage. 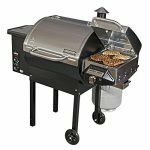 You can also turn it up to the 250-degree range to produce nearly competition level barbecue pork shoulder, and brisket. 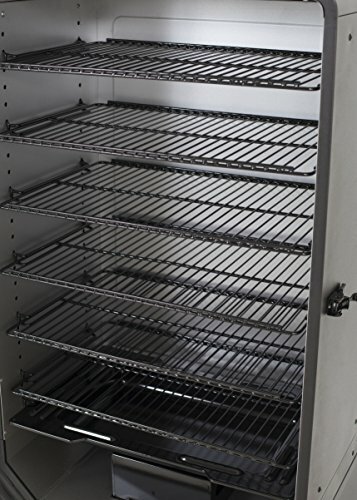 The six racks also allow you to make a truly staggering number of succulent ribs. When it’s cranked up to its higher temperature range, you can even use it to bake things like cast iron skillet cornbread, or pizza. You might want to cover any baked goods with heavy duty aluminum foil for the first half of a baking session, just to make sure they don’t absorb too much smoke. The six porcelain coated grates provide you with an impressive 2196 square inches of smoking space. This means you can make a huge batch of perfectly smoked venison jerky or up to 12 racks of ribs. There isn’t quite enough space on a single rack to smoke a complete brisket. You could, however, separate the point from the flat and simply smoke the flat on one of the higher racks. One minor knock on the Pit Boss 7700 is that it doesn’t come with any hooks for hanging sausage. If you do want to suspend links or rings of homemade sausage, you can just use some butcher’s twine to tie them to the top grate. The heat deflector and water/drippings pan are something that you would expect to come standard with any cabinet-style smoker. However, the porcelain coating on them is a nice touch, and it’s not something you find in competitor smokers. The porcelain coating on the drip pan, deflector, and cooking grates really help with all levels of cleanup. Wood ash should be thoroughly cleaned out of the fire pot, and safely disposed of. If the front of the cabinet or the thermometer probe is excessively covered in residual smoke or other material, you might want to give it a good wipe down. One of the most important aspects of cleanup is removing the excess unburned wood pellets. If they are left too long in the hopper, ambient humidity can start to affect the natural lignin binder that holds each individual wood pellet in its shape. This leaves you with a hopper that it jam-packed with an incredibly hard block of wood fiber. This is not something that is covered under the warranty! 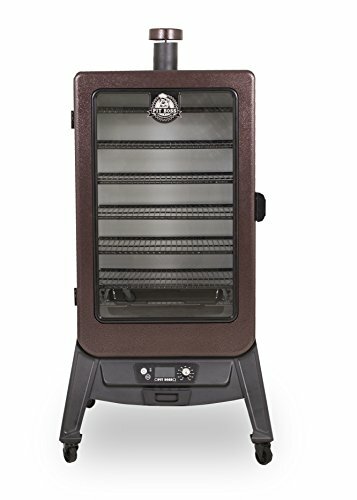 The Pit Boss 77700 Wood Pellet Smoker comes with a 1-year warranty against defects and workmanship on all parts, as well as a 1-year on electrical components. This is less than what you find with most competitor smokers, that tend to carry a two or a three-year warranty. 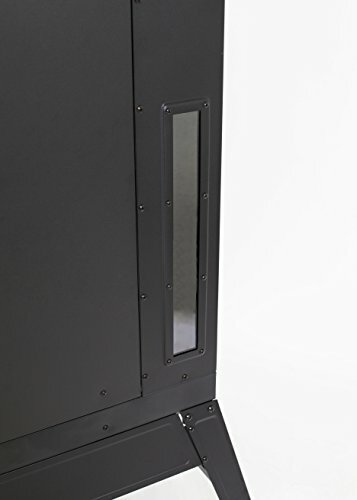 If you need a smoker cabinet, but you also want the ease and convenience of a wood pellet grill/smoker, then the Pit Boss 77700 Wood Pellet Smoker deserves a good hard look. It is capable of cold smoking, traditional barbecue, and even baking up to 450-degrees. Just make sure to take good care of it, and always remove the excess wood pellets after each use.